I have been creating food themed costumes for my minpin, Jabez, over the past several years. This year, I wanted to create my favorite food for his costume-PIZZA! I wanted it to be different from other pizza costumes, so I made the whole pizza and cut a slice out of it for his costume. All pizzas start with a good crust, which I created by cutting out a large circle of thick cardboard, with a slice cut out of it. To build up the edge of the crust on both pieces, I took a couple of pool noodles, cut a slit in the side of them and wrapped them around the outer edge of the cardboard. After that, I covered both pieces with brown fabric, coated them with mod podge, then painted them a crusty brown. Just like a real pizza, I started with the sauce (red paint). Next came a layer of cheese (mod podge, tinted yellow with acrylic paint) which I painted on. Now the really fun part-the toppings! I decided to go with pepperoni, sausage, mushrooms, green bell peppers, olives, onions and extra cheese. The pepperoni, green bell peppers and mushrooms were cut out of sheets of colored foam. I used a heat gun and a curling iron to curl each slice of pepperoni. The sausage was created by mixing crumbled-up styrofoam, mod podge and paint up inside a large ziploc bag which I squished around until each piece was coated. The black olives were cut out of a grey styrofoam food tray with a tiny round cutter. I lost count of all the hours I spent on making the toppings. I had pizza on my mind practically 24/7. I had my husband bring home pizza for dinner a few times, telling him I needed them for research purposes. I was most pleased with how my onions turned out. I glued 5 sheets of micro thin foam together, spray painted one side with 2 shades of paint to get the color I wanted, then rolled it up jellyroll fashion, using a spray glue to hold it together. When I cut slices off, they looked like the real thing. After putting all the toppings on,starting with the pepperoni, then the sausage, mushrooms, onions, bell peppers and olives (all in that order) I drizzled more mod podge cheese over the top, which helped to make sure everything was glued down in place. The cheese drippings off the sides of Jabez’s slice of pizza was hot glue which I painted after it hardened. I used industrial strength velcro to attach the slice of pizza to a black fleece vest that I made for Jabez, using a basic dog jacket pattern. It was at this time that I made the decision to take a “bite” out of the pizza slice so it would be more comfortable for Jabez, otherwise, the poor guy couldn’t sit down, due to the length of it! The pizza slice only weighed 14 oz. Since every good looking outfit needs a matching hat to go with it, I made a matching hat with toppings on it for Jabez. 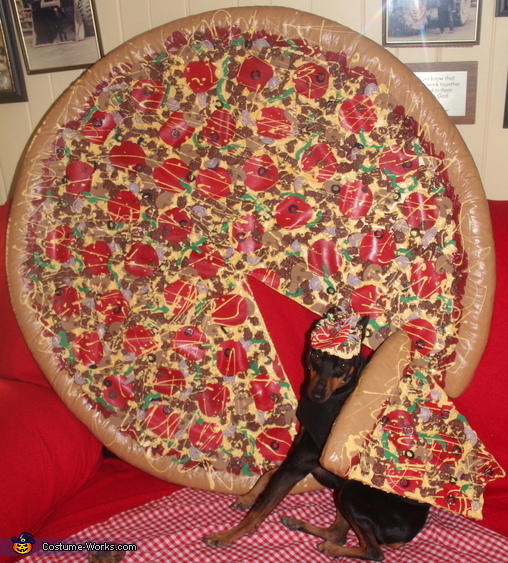 Originally, I was going to wear the pizza part of the costume and have Jabez wear the slice of it. We were going to wear it in an annual Howl-o-ween Pet Parade and costume contest. Those plans got interrupted and changed the first weekend in October when wild fires raged through Santa Rosa, California, coming within just 1/2 mile from my home. Neighborhoods went up in flames so quickly, that many people barely had enough time to evacuate with just the clothes on their back. We were evacuated from our home for a week before we were allowed back into it. The parade was canceled, along with most other Halloween events in Sonoma County this year. I was disappointed about that, but, very grateful and blessed that we were safe and didn’t lose our home. I was determined to finish the costume, even though I lost a week of being able to work on it. I went ahead with my original plans for the costume with the exception of me wearing the pizza pie part. I decided to use it as a prop with Jabez next to it and call Jabez’s costume “A Piece of the Pie”. Jabez loves to pose for pictures wearing whatever I put on him. He will stand for pictures and do a play bow, too. People are always amazed at how much of a ham he is!